Thank you for supporting our work and making it possible for horses like Jack and Evan Claire to live out their days in peace and happiness. Today our hearts are with their wild relatives who may not be so lucky. Until the helicopters are grounded, and all wild horses are safe, we will continue to be their voice. Jack, this Sheldon foal is safe at our sanctuary. His relatives in the wild are not. The Roundup of the Last Wild Horses of the Sheldon Refuge Has Begun. It is with a heavy heart that I write to tell you that on August 7 the US Fish and Wildlife Service has begun to roundup the remaining wild horses of the Sheldon National Wildlife Refuge. These horses have free ranged on the refuge for generations . . . now their fate uncertain at best. Because Fish and Wildlife is not federally mandated to manage wild horses there is nothing we can do legally to stop this tragic roundup. I am thankful that the 50 Sheldon horses we rescued from a previous roundup are safe at the sanctuary, living the life they would have lived in the wild. 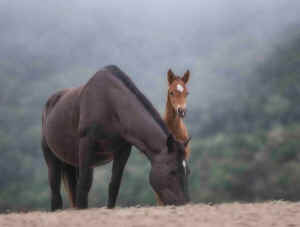 Evan Claire, the young foal pictured on the right, will never know the trauma of a roundup or of being torn from her mother. She will grow up along side her best friend Jack (the foal pictured above with his dam), and the two of them will spend their years playing, learning and growing up within their herd community. We cannot house all of the horses that are removed from the wild. But, with your help, we provide a safe haven to some 400 wild horses and burros every day and our sanctuary promotes solutions for "in the wild" management. These solutions are being looked at by Members of Congress, the BLM, National Academy of Sciences and they WILL be the way forward!